Last Clear Chance is a 1959 American short film produced and directed by Robert Carlisle. 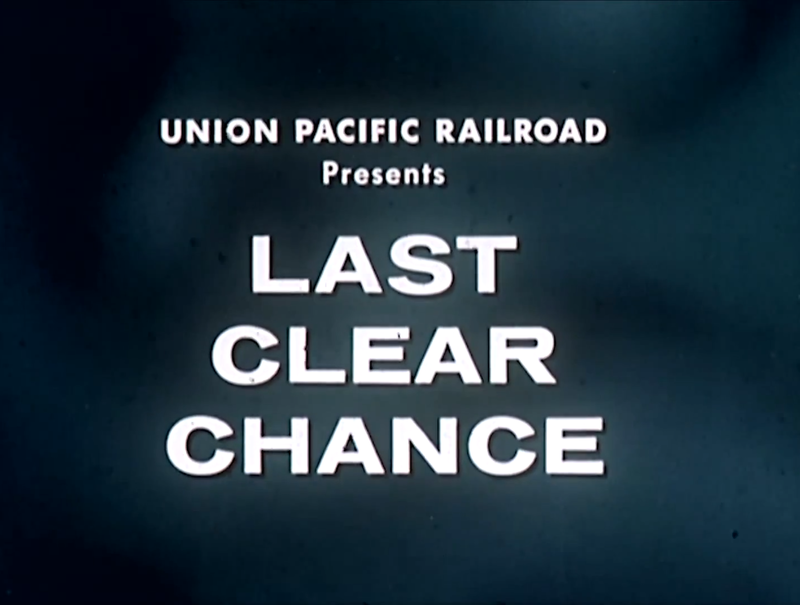 Sponsored by Union Pacific Railroad, Last Clear Chance is a safety film intended to warn young drivers to be careful at railroad crossings. The film’s cast consists of William Boyett, Harold Agee, Mrs. Harold Agee, Tim Bosworth, William Agee, Christine Lynch, and Lou Spraker. Written by Leland Baxter, the film was shot in parts of Idaho. Wondsel, Carlisle & Dunphy Inc, based in New York City, served as the film’s production company. The film centers on the Dixon family, in particular Alan Dixon, who has recently received his driver’s license and is eager to begin driving a car. When local police officer Hal Jackson visits the Dixons and learns that Alan’s license has arrived, he sits down and tells Alan ways to drive safely and avoid getting into accidents. Although the film is fictional, a real family served as the inspiration for the film’s scenario. During production, assistance was provided by staff of the National Safety Council, along with the Idaho State Police and the Colorado State Patrol. Last Clear Chance was distributed by Union Pacific in 1959, and was circulated widely in the years that followed. Met with warm reception from safety workers, the film was featured in an episode of Mystery Science Theater 3000 that originally aired in 1993, and clips from the film were used in the 2004 film Panorama Ephemera. The film’s copyright was never registered, and it is in the public domain. A copy of the film is preserved in the Prelinger Archives, where it is able to be downloaded or streamed online free of charge.